If you are a CMV driver, meeting the DOT physical requirements is crucial to your career. That is why FastMed’s team of medical professionals offer DOT physical exams with your schedule and budget in mind. Have Questions About DOT Physical Requirements? FastMed Has Answers! Will there be a drug test during my DOT physical exam? Not always. However, some companies do require a drug test as part of the DOT physical exam. In these instances, the medical professionals at FastMed are equipped to test for drug traces in your urine such as marijuana, cocaine, opiates, amphetamines/methamphetamines, and phencyclidine. If you test positive for any of these, you may fail the DOT physical exam. What other evaluations can I expect from my DOT physical exam? How long is my DOT physical exam valid? Generally, if you meet all of the DOT physical requirements and pass your DOT physical exam, the results are valid for 24 months. However, in the case of a particular medical condition needing to be monitored, a medical examiner’s certificate could be issued for a lesser time. Who will be performing my DOT physical exam? 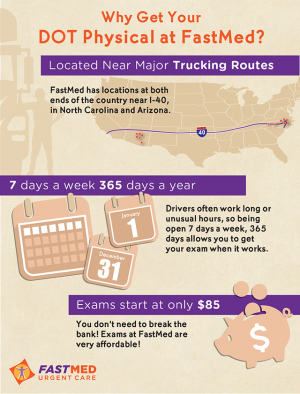 FastMed has numerous medical professionals on staff to take care of your DOT Physical needs. All of our medical professionals are certified and are required to complete routine training every 5 years to maintain their certification. On top of that, they must pass an exam every 10 years to stay certified. What this means for you is reliable health care from professionals you can trust. FastMed’s commitment to you does not stop at DOT physicals. We also offer multiple services including routine check ups, flu shots and vaccinations. FastMed knows life can be unpredictable. This is why we stay open late and on weekends to ensure you get the quality health care you need, when you need it, no appointment necessary.